The US says it will not allow its al-Qaeda suspects to testify at the retrial of a man charged with helping to plot the 11 September 2001 attacks. The decision was announced as Moroccan Mounir al-Motassadek appeared in court in Hamburg, Germany, on Tuesday. The stance is seen as a major blow for the prosecutors. 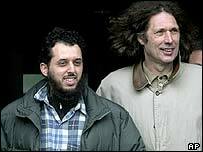 They had hoped to use testimony from Ramzi Binalshibh, an al-Qaeda suspect in US custody, to reverse the quashing of Mr Motassadek's earlier conviction. A letter from the US Justice Department read in court said terror suspects in American custody would not be allowed to testify. The letter cited security concerns, as well as the need to protect secret information. The Justice Department also said an FBI agent would be sent to give evidence at the retrial. The German authorities had asked Washington in May to give them direct access to Mr Binalshibh and other witnesses. But the US letter said that even information on whether a given individual was in custody was classified as secret. The court also heard a statement from Germany's interior ministry saying it was working intensively with the US to get missing information. Earlier presiding judge Ernst-Rainer Schudt promised the accused a fair trial and promised to fill the "black hole" in the evidence. Mr Motassadek, 30, was sentenced to 15 years in prison last year for helping the 11 September hijackers based in Hamburg. At the time of his conviction, he was the only person to have been found guilty in connection with the attacks on the US. But the verdict was put in doubt after the acquittal in February 2004 of another Moroccan, Abdelghani Mzoudi, tried on the same charges in Germany. He was cleared after reports emerged that Mr Binalshibh told US interrogators that al-Qaeda's Hamburg cell - which played a central role in the attacks - consisted only of himself and three suicide hijackers. By implication, defence lawyers argued, neither Mr Mzoudi or Mr Motassadek was guilty. Prosecutors believe, however, that the full transcript of his interrogation would put it in a different light and allow them to secure the conviction of both Moroccans. In March the verdict against Mr Motassadek was quashed on the grounds that Mr Binalshibh did not give evidence. Mr Binalshibh is a Yemeni national and suspected al-Qaeda lieutenant. He has boasted in a television interview that he masterminded the 11 September plot. He has been held by the US since he was arrested in Pakistan in September 2002. Prosecution lawyers had hoped Washington would allow its prisoner to appear in court via video-link, along with another alleged senior al-Qaeda figure, Khalid Sheikh Mohammed. Mr Motassadek's lawyer Josef Graessle-Muenscher said he will argue as the trial opens that the case should be dropped. Mr Motassadek is accused of handling accounts for the Hamburg hijackers, Mohamed Atta, Marwan al-Shehhi, and Ziad Jarrah, while they plotted their attacks, and of knowing their plans. "The US is still refusing to hand over any detainees to the German court"